A museum in St Petersburg about both the Soviet era (and the revolutionary developments that led to the founding of the communist state) as well as political developments in Russia since the break-up of the USSR, though not quite up to the present day. The museum's layout is a bit confused, with some overlaps between the separate two or three main exhibitions, but it's definitely worth exploring. More background info: Formerly this was the “Museum of the Revolution” until the collapse of the Soviet Union. The building had a shrine-like significance for Russian revolutionary history: Lenin and his Bolsheviks were based here and the great man gave numerous speeches from the building's balcony after his return to Russia in the run-up to the October Revolution in 1917. Before the takeover by the Bolsheviks, the building, a large art nouveau mansion from 1906, was the city palace of one Matilda Kshesinskaya, a famous Polish ballerina who was once a mistress of the later tsar Nicholas II. 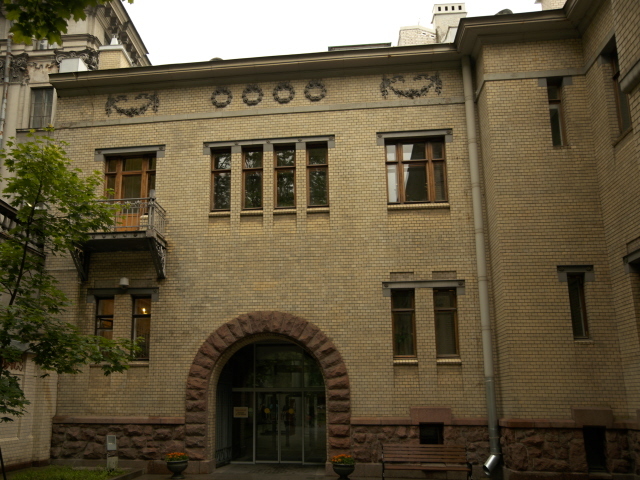 After the revolution Kshesinskaya had moved on to France, and the building housed a series of different organizations until it was turned into a Soviet museum to celebrate the revolution in 1957. Since the collapse of the USSR, the museum has been radically transformed to cover more recent political developments in post-Soviet Russia too, almost to the present day, and to represent the Soviet era in a less rose-tinted light to also include the various rather dark aspects of that era (repression, hunger, gulags, etc.). Its collection is extensive, if a bit confused in the way it's laid out these days, but I would say it's still the most significant of St Petersburg's many museums from a (political) dark-tourism perspective. What there is to see: This is actually more than just one museum with one permanent exhibition, but a somewhat confusing combination of two or three large thematic main exhibitions, a pilgrimage shrine (those Lenin rooms) plus some additional elements. I was first directed towards the one exhibition by a museum warden after paying my admission fee. When I came out and still hadn't seen the Lenin rooms, I asked about them and only then was I told that there is another main section on the second floor accessible by lift. Moreover, the foyer also has museum-like exhibits, the basement part too with the cloakroom, cafe and toilets, plus there was an additional exhibition in a side room. The first exhibition starts off by going back to the tsarist era and the earlier stirs of revolutionary social unrest in the late 19th and early 20th century. The explanatory texts are mostly bilingual, in Russian and English (the latter in OK but far from perfect quality), but the original documents and labels are only in Russian. However, you can borrow laminated sheets from perspex boxes dotted around and these sheets provide some explanations in English of the contents of the display cabinets. There are also some screens playing (silent) film footage and a few interactive elements. In addition, there are QR codes you can scan with a smartphone to access English-language information (in both text and audio-track form). One particular dark artefact on display in this early section worth highlighting is a shirt, bloodies and with a bullet hole, that belonged to one of the victims of Russia's “Bloody Sunday” of 22 January 1905. This massacre of protesters by the Imperial Guard caused outrage and led to the Revolution of 1905 – which led to constitutional reforms but not yet to the end of tsarist rule. This came, as is well enough known, in the “proper” Russian October Revolution of 1917, in which the Tsar was not only deposed but killed, together with his family. This is the next topic in the exhibition. In addition to the exhibition as such, it is also worth looking up away from the displays to take in the Soviet-era interior design with grand socialist-realist mosaics, hammer-and-sickle reliefs and such things. The exhibition then moves into the era of the Soviet Union, and how the revolutionary ideals were quickly betrayed and following Lenin's death were replaced by the repression and terror of Stalinism. Collectivization and the shortages it caused is also covered. The hunger crisis of 1932-1933 is mentioned, though the Ukrainian name for it, Holodomor, is not (as far as I could see). The gulags are represented through inmates' clothing and personal stories. And the hardship of everyday life of city dwellers is illustrated by a life-size mock-up of a typical communal kitchen of Soviet apartment blocks of the 1930s and 40s. Another mock-up is of a simple wooden barrack in which workers were housed in basic and cramped conditions. At the end of this section is a large painting of Stalin – behind bars! It's kind of a signature display of the museum, but of course it's only an “artist's impression”. Stalin the dictator and military generalissimo (as he is portrayed here) never ended up imprisoned. 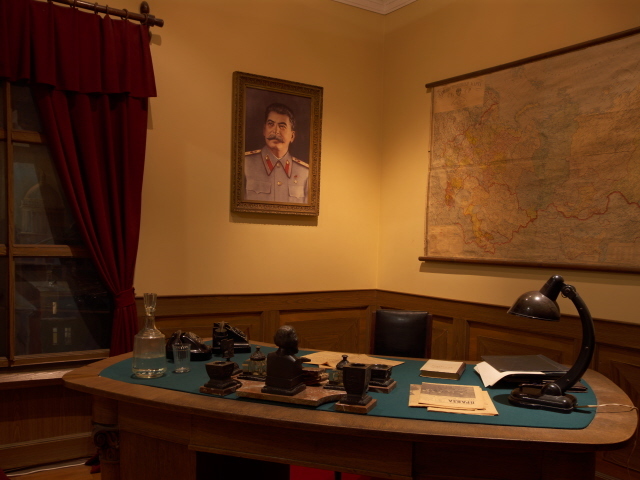 A nearby mock-up of a typical Stalin-era party-leader office from the 1940s also has a Stalin portrait on the wall to illustrate his omnipresence at the time. But then the style of the exhibition suddenly changes. What follows is a maze of smaller exhibition rooms in an asymmetrical layout. 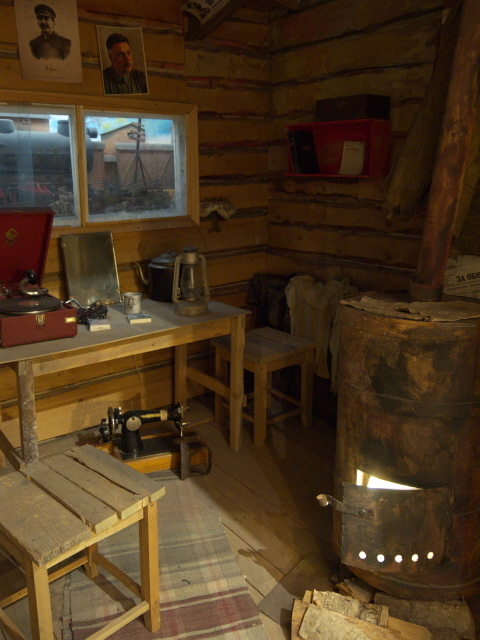 The display sections also seem a bit more modern here – for instance it includes a computer from where you can select a number of videos to be played about, for instance, the Soviet political terror, Stalin's funeral, Youth festivals, and much more. Thematically this section takes visitors through the more modern Soviet times of the Khrushchev and Brezhnev eras. These two men are represented not only through photos and documents, but also in artefact form, e.g. Krushchev's medal-studded jacket or an almost comical, wonderfully kitsch vase with a portrait of Brezhnev on it. Otherwise life in post-WWII Soviet times is illustrated through the great achievements of industrialization or prefab housing programmes as well as the more glamorous Space Race and atomic technology – e.g. on display are models of Sputnik and of the “Lenin” icebreaker (the real thing is now a museum ship in Murmansk). 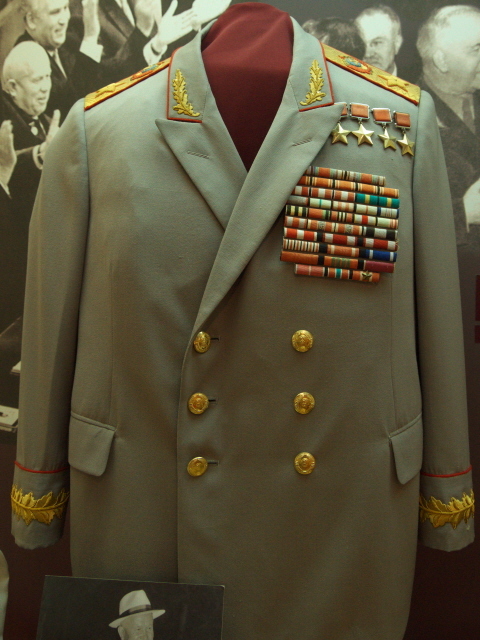 Some personal items of the Soviet Cosmonautics' poster boy Yuri Gagarin are on display too. Plenty of propaganda posters line the walls. An interesting little detail I spotted in the section about leisure and holidays in Soviet times was a booklet about vacationing in Crimea. Now that Russia has taken (“back”) Crimea from Ukraine, this could be a current exhibit. The next hall has at its centre a display about the military conflicts the USSR was involved in since WWII together with the relative numbers of soldiers killed in them. Unsurprisingly, the war in Afghanistan was by far the worst of those conflicts in that respect. Another section is about the political underground and famous artists such as Vladimir Vysotsky. A less glamorous and distinctly dark aspect covered too is the abuse of psychology and mental hospitals to silence dissidents (also with heavy-duty chemical drugs). One display cabinet is also devoted to the gulag system (see esp. Perm-36). One semi-separate section chronicles the evolution of Soviet propaganda- and advertising posters as well as Soviet-era products themselves. 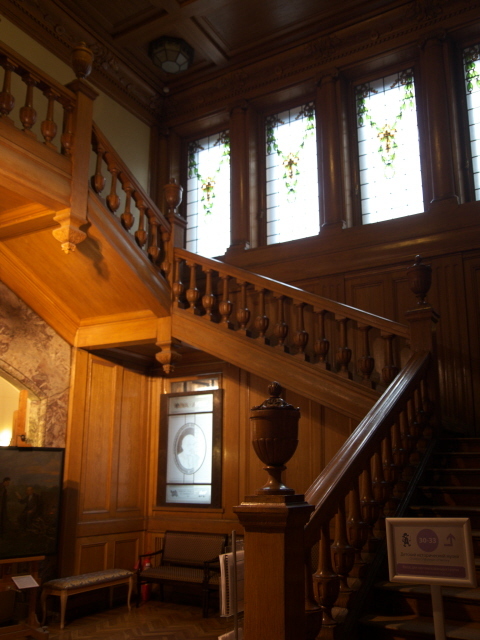 You then come to the grand wooden staircase – but the way up was blocked. Apparently it would have led to a children's section. Opposite however was a completely separate small special exhibition about the State Duma (see under Moscow), developed for the 100th anniversary of the establishment of this first Russian parliament in 1906 (one of the outcomes of the 1905 revolution). It's all in Russian, but again you can borrow a folder with English annotations. There's a little mock-up of the speaker's podium, but otherwise this was one of the less engrossing sections, I found. Finally back in the foyer I needed the toilet and on my way back was surprised that there were yet more rooms downstairs with additional, and apparently unconnected exhibitions, possibly temporary. These were all in Russian only, but I figured that one of them was about pollution. And one display case held relics from the 1980 Moscow Olympics. Back at the ticket desk I then asked where I'd find Lenin's famous office rooms, and was sent to the lift to go to the second floor. Up there I first found the other main exhibition(s). I might have missed all that had I not asked! I found the second main exhibition even more confusing in layout than the rest of the museum. I may have entered through the wrong entrance, but it seemed to me to jump between different epochs and themes. Yet I guess there must have been a way of doing it in a more chronologically correct order. First I hit upon some WWII-related exhibits, such as a helmet with a bullet hole in it and a piece from the Brest Fortress. Then the exhibition seemed to head backwards in time, namely to the Civil War that followed the October Revolution of 1917. The latter was illustrated by some film footage projected onto a wall in between all sorts of propaganda posters and flags. In addition there were also several interactive screens on which interviews with veterans could be played, in Russian, but you could select subtitles in English, German, French or Spanish. The middle part of this second main exhibition had a lot of overlaps with the first one. Revolution, collectivization, Stalinism, industrialization, and so on. One exhibit here is one of Stalin's death masks, next to coverage of his OTT funeral hype. To contrast with this is a display of the the script of the famous speech by his successor Khrushchev that initiated the process of de-Stalinization. We then move more into the modern era, where exhibits include e.g. a vinyl record of speeches by Brezhnev, a shirt worn by nuclear-physicist-turned-dissident Andrei Sakharov (cf. Sakharov Centre) or a cap that belonged to the legendary film director Andrei Tarkovsky. The counter-culture and protests of the 1980s are covered, amongst other things, by representations of concert posters and photos of bands such as DDT or Kino (not very well known in the West, but real big names in Russia!). At the same time the Gorbachev era gets a good mention too. But at this point the exhibition gets rather chaotic and, to be frank, a little weird. I means what's with the Christmas trees hanging upside down from the ceiling?!? … or the asymmetrical “sculpture” involving about a dozen little screens. Maybe it's all meant symbolically in some way. Following the fall of the Berlin Wall – there's a large piece of it on display – and the dissolution of the USSR we eventually come to the post-Soviet times of Russia, including the crisis of 1993 when Moscow's White House came under fire in the early Yeltsin era. There are some items on display from that time, such as shards from a mirror destroyed by bullets and some barbed wire (cf. also Museum of Contemporary History in Moscow). The transition from Yeltsin to Putin on New Year's Eve 1999 is covered by transcripts of the speeches both gave on that fateful night. But as far as I remember the exhibition did not proceed much further to get as far as the present day. 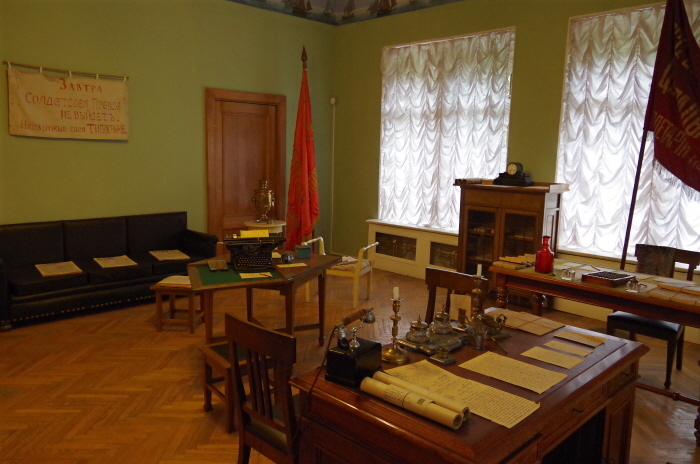 And then, through a door, I suddenly, finally, found myself in the reconstructed Bolshevik office and the room where Lenin worked after his return from exile to Petrograd in April 1917 until July (when the Bolsheviks were kicked out again). So this is the original shrine to the Revolution and Lenin that has formed the heart of the museum since it was set up in the Soviet Union. 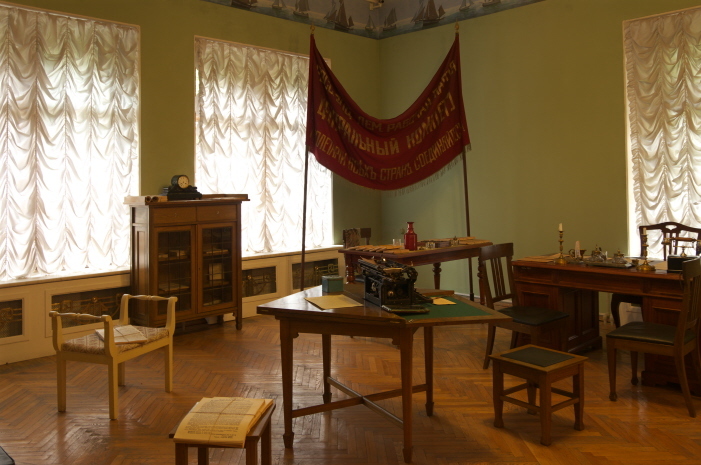 You can see the desk Lenin and his associates worked at, communist banners, and the door to the balcony from where he and others addressed their worker followers during that turbulent time. So topically we're back to 1917 and the Revolution. And in fact this would probably have been the starting point of that part of the exhibition on this floor entitled “The Revolution 1917-1922” (i.e. including the Civil War). Apparently the other parts on this floor and the floor below have the collective titles “Man and Power in Russia in the XIX-XXI Centuries” and “The Soviet Epoch: Between Utopia and Reality”, respectively. Yet it was really not obvious to me where the exact boundaries between these nominally distinct parts really were. So instead of being the grand opening, for me seeing the Lenin office was the finale. Back downstairs, there are also some extra exhibits in the winter-garden-like space with a glass roof behind the ticket desks. And at the time I was there a large screen showed excerpts of a film about Lenin. There's a museum shop here too, selling predominantly all manner of Russian and “Soviet” souvenirs (such as coffee mugs with “CCCP” on them). All in all, though the museum felt a bit confused and erratic at times, I still found it very worthwhile to see, in particular for some of the artefacts and the stories about the underground and less glamorous aspects of the USSR. The design and layout are at times a bit forced and over the top – but that can also have some entertainment value. Location: on Kuibysheva Street 2-4 in the Petrogradsky district across the Neva River from the city centre core of St Petersburg, just east of the Peter and Paul Fortress. Access and costs: Quite easy to get to and not expensive. Details: To get to the museum you can either walk, e.g. from the old city centre by crossing the Neva on the Troitskiy Bridge (ca. 30 minutes from the western end of Nevsky Prospekt) or by using the nearby Gorkovskaya metro station (line 2), which is only a short, five-minute stroll away. Opening times: Mondays/Tuesdays and Saturdays/Sundays from 10 a.m. to 6 p.m., Wednesdays and Fridays open to 8 p.m., last admission an hour before closing. Closed Thursdays and the last Monday of each month. Admission: 200 roubles (under 18-year-olds free). Audio-guides cost another 200 roubles and are available in English, German, French, Spanish, Italian and Chinese. Live guided tours are also available and cost 1000 roubles for 1-5 people, and 1500 roubles for groups between 6 and 20 participants (cheaper in Russian). Time required: ca. one-and-a-half to two hours, possibly even more if you can understand Russian. Just a stone's throw away is the main pedestrian access to the Peter & Paul Fortress and a few blocks up Kamennoostrovsky Prospekt is the Kirov Museum. Just south of the Political Museum towards the bottom end of the public park that is Troitskaya Ploshchad is another memorial to victims of political repression and gulag victims. It's known as the Solovetsky Stone, as the boulder of granite that forms the main part of the monument was brought here from the island of that name in the White Sea where one of the first Soviet prison camps for political opponents was set up. A short walk further east along the banks of the Neva River you get to the place where the cruiser Aurora (see under St Petersburg) has found its permanent mooring. Combinations with non-dark destinations: In general see under St Petersburg. Just a few steps north from the museum is one of St Petersburg's perhaps most unexpected architectural marvels: the mosque. Built in the early 20th century it is said to be modelled on the grand Gur-e Amir Mausoleum in Samarkand, Uzbekistan. The intricately designed blue dome, the grand portal and the two minarets are surely worth a look!